Originally published at Aljazeera America on April 15, 2015 by David Bacon. 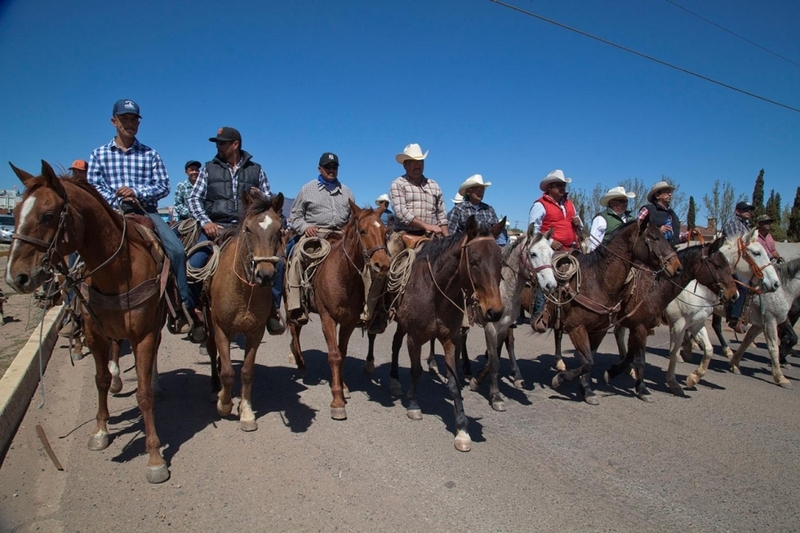 Striking miners march at the huge Cananea copper mine in Sonora, Mexico, on March 27, 2015. An overview of the plantón near the mine. CANANEA, Mexico — The pipes have gone silent. 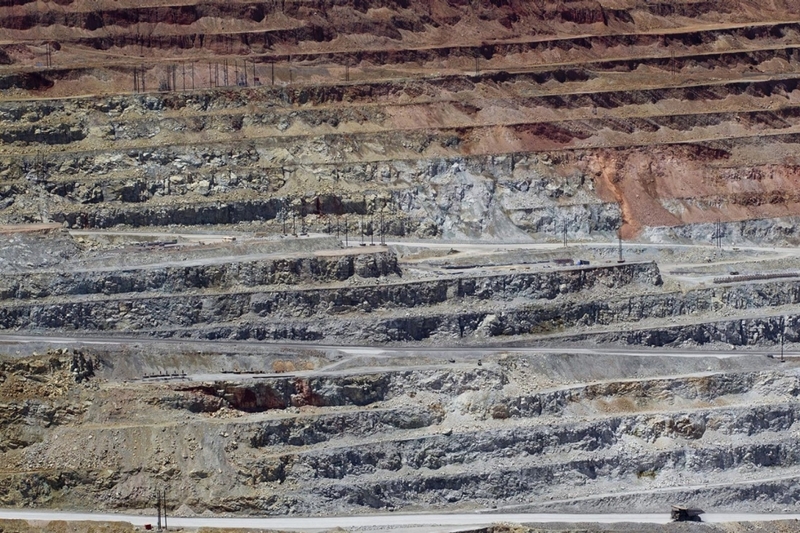 Gone is the hum of water flowing through them to the world’s second-largest copper mine, just south of the U.S. border. Instead, in the normally empty desert here, tents and buses line the highway. Dust and smoke from cooking fires fill the air while hundreds of people listen to speeches and discuss the day’s events. 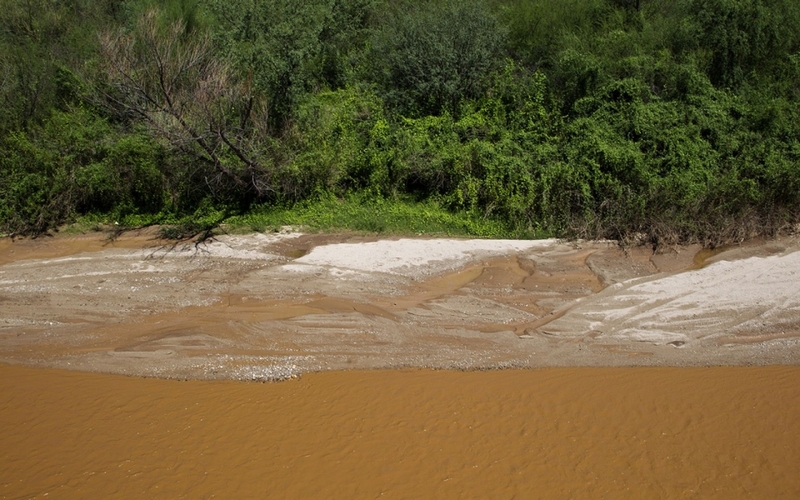 The Sonora River, Aug. 12, 2014, a few days after the Cananea mine leaked 10.5 million gallons of sulfuric acid into the water. The face of the copper mine. Arturo Rodriguez, of the office of the Mexican attorney general for environmental protection, told The Associated Press that the cause was lax supervision at Cananea, compounded by rain and defective construction. Grupo México, the company that owns the mine, didn’t respond to requests for comment, but according to Yahoo News, Juan Rebolledo, vice president for international relations, said that the acid wasn’t toxicand “there’s no problem, nor any serious consequence for the population, as long as we take adequate precautions.” Grupo México’s solution was to pour calcium into the river to neutralize the acid. Miners charge, however, that the workers for Tecovifesa, a construction contractor employed by Grupo México since the strike, lacked experience in dealing with mines’ toxic-waste ponds. “Before the strike, experienced union members who were direct employees did all the work,” says striker Sergio Martinez, who worked at Cananea for 13 years. The company waited a day after the spill to inform authorities and two days to alert townspeople. Many only discovered what had happened when the water turned orange. “Our children were at the river that day,” remembers Reyna Valenzuela, from the town of Ures. “We didn’t know they would be affected, because the company didn’t tell anyone.” The children broke out in rashes, she says, which doctors eventually told her were due to heavy-metal exposure. Other residents began to experience more serious health problems. In December, Tolano and other union leaders began discussing plans to shut down the mine. This winter, strikers and community leaders called meetings in town plazas and made speeches broadcast with speakers rigged to the back of pickup trucks, discussing the impact of the spill with residents. 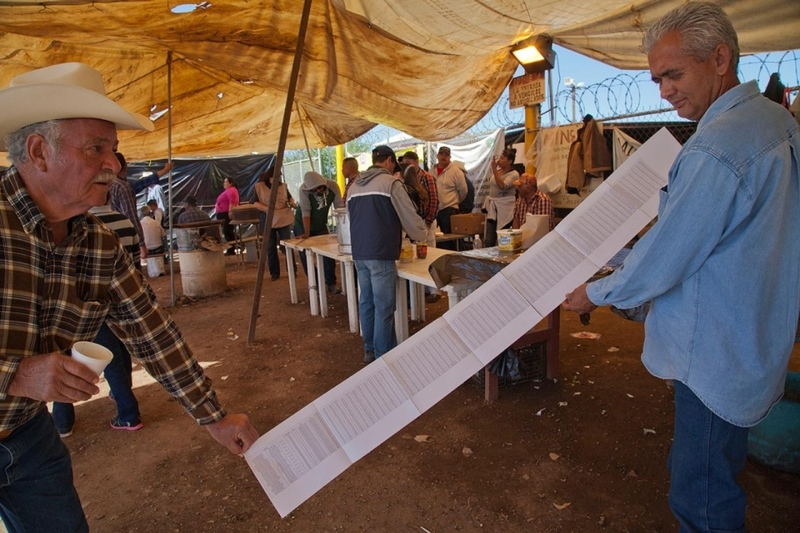 On March 18, buses filled with several hundred farmers headed from the towns toward Cananea. Alerted to their arrival, the mine’s managers called in hundreds of police to keep the strikers from blocking the gates. But the protesters outflanked the cops and roared down the highway to the lightly guarded pumping station. Facing hundreds of angry miners and farmers, the operators shut down the pumps and fled. And as the pumps fell quiet, so did 80 percent of the operations at the mine. Rios Leon holds a list of what he says were the heavy metals found in a test of his blood. 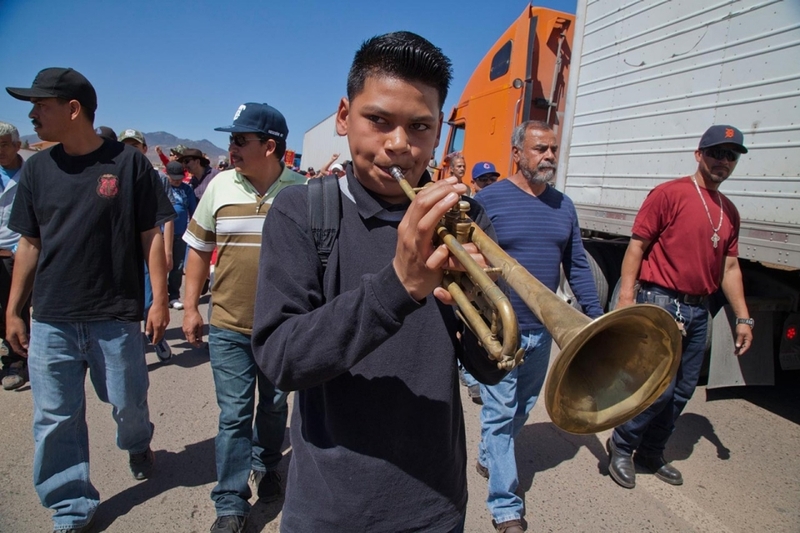 A drum and bugle corps marched with the miners and farmers on March 27, 2015. Some of the miners rode their horses in the march. 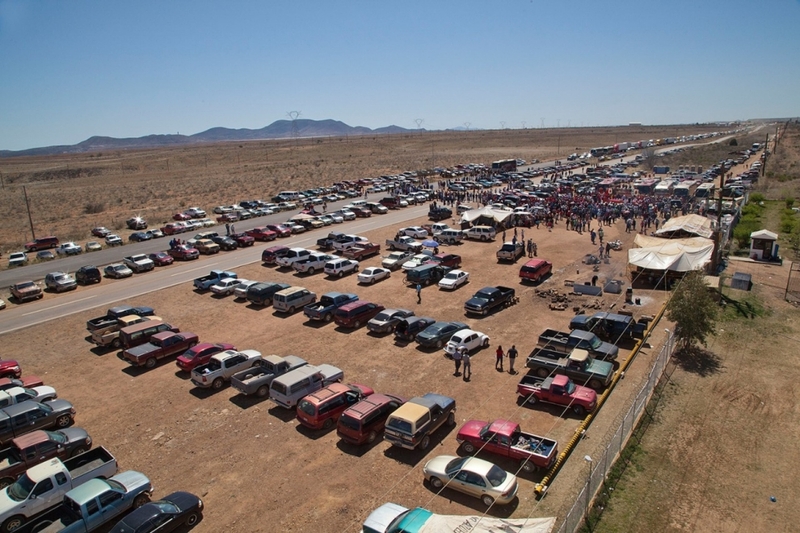 Under Mexican law, an enterprise on strike cannot continue to function, so the mine’s operations were halted. But Grupo México asked the administration of then-President Felipe Calderón to declare the strike illegal. In spite of court decisions upholding its legality, the government complied. Police drove miners from the gates in 2010 and the mine was reopened with contracted labor. 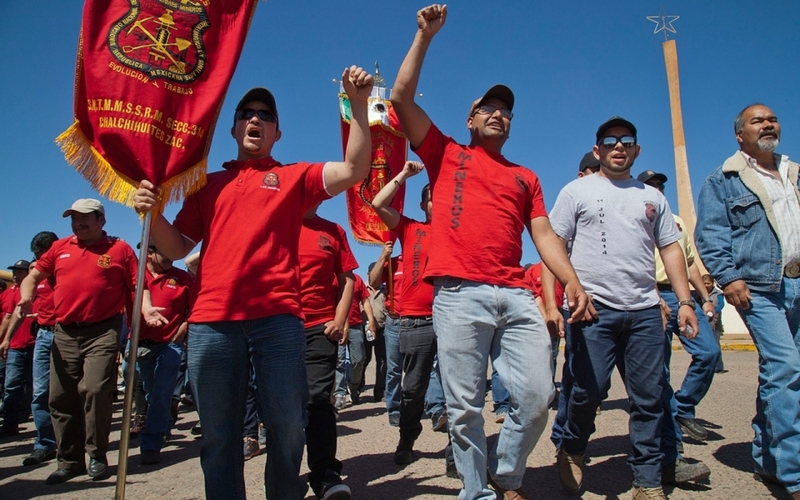 Since strikers make up most of the population of Cananea, the company brought workers from southern Mexico to replace them. Grupo México created a new business entity to hire them through contractors. Sergio Martinez says that before the strike, miners got a base pay of 1,800 pesos ($128) for working eight hours a day, six days a week. With a productivity bonus, they earned at least 3,000 pesos weekly. Today, the contracted employees earn only 1,200 pesos a week, says Martinez, and work 12 hours a day instead of eight. The government authorized the creation of a company union, which signed a contract with Grupo México at the new lower wages. Adjusted for inflation, the average wage in mining nationally is 21 percent lower today than it was in 1978. Says another miner, who asked to remain anonymous, “90 percent of the people now working in the mine are from far away. This is very humiliating for people here. You have kids and there’s no work for them either.” Like many others, this worker crossed the border without documents to find a job in Arizona. “I left my family here. The pain of our separation can’t be compared to anything,” he says. Reyna Valenzuela, in white, with her children, Gladys and Roman, in green, and husband Juan Piña. The purpose of the plantón, says Tolano, is not just to stop the mine’s operation. 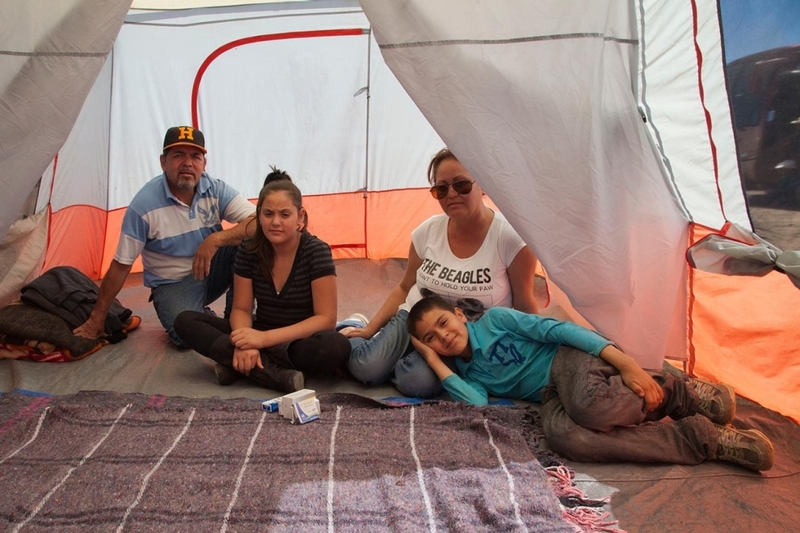 The union and residents have organized a coalition, the Sonora River Front, which is demanding that the government force Grupo México to clean up the river and take responsibility for the health and lost income of residents. It also seeks to restore the strikers to their jobs. This effort also includes the U.S. union for copper miners, the United Steel Workers. Manny Armenta, a USW representative, has helped the local union in Cananea since the strike started. The night the police broke the lines at the gate in 2010, he led families out of the union hall to safety. The U.S. union has given sanctuary to the head of the national miners’ union, Napoleón Gómez Urrutia. After 65 miners died in a 2006 explosion at Grupo México’s Pasta de Conchos coal mine in Coahuila, about 50 miles from the Texas border, Gómez accused the corporation and government of “industrial homicide.” Workers had complained of gas leaks and struck repeatedly over safety concerns. Five days after the explosion the company halted rescue efforts, and the government announced the mine would be closed. Within weeks, the conservative administration of President Vicente Fox charged Gómez with fraud, and he left Mexico to escape arrest. Courts have found all charges against him groundless, and he has been re-elected union president several times. Nevertheless, he continues to stay in Vancouver, British Columbia, as a guest of the United Steel Workers, worried that the government and Grupo México will find another pretext for jailing him should he return. The U.S. union is trying to renegotiate its contract with Grupo México’s ASARCO. Two years ago, the Mineros, the national miners’ union, and the USW agreed to join to form a single union. The merger has not been completed, but they now support each other in dealing with their common employers and look to the day when their bargaining can be coordinated.